As Murphy would predict, I recently ran out of all my facial care products simultaneously. I debated whether to purchase the same humdrum products that I had previously used—ones that had done nothing extraordinary or even noticeable to my face, but ones that I was simply used to. In the midst of this skincare conundrum, I became introduced to a new brand that had never before crossed my path. It’s called Eve of St. Agnes, and it is a handcrafted skincare line based out of England. Now, I’ve always had a slight fascination with the UK (I just became engaged to an Englishman after all!) and decided to give this all-natural skin care line a shot. It was love at first try. 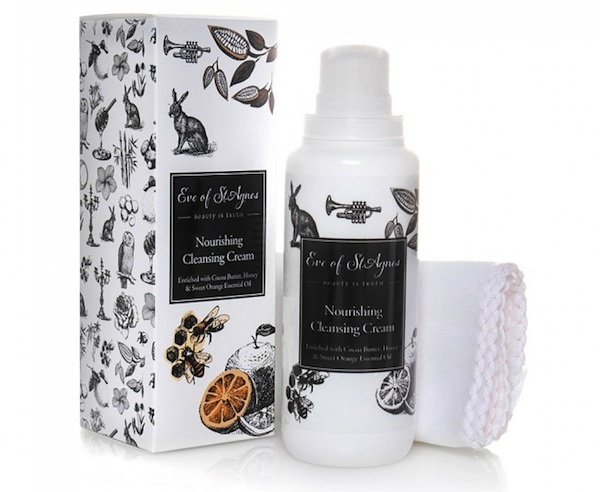 The Nourishing Cleansing Cream is buttery soft, smells of zesty essential orange oil and also contains honey and cocoa butter. The detergent and soap free product comes with a linen cloth that is meant to be used as a gentle emulsifier and skin smoother. The product claims to remove make up and deeply cleanse the skin in one silky step, and it doesn’t disappoint. In addition to the loveliness of the Nourishing Cleansing Cream, I have become a fan of the Hydrating Facial Silk, which is the most hydrating yet least thick and sticky moisturizer I’ve ever used. It is easily absorbed and doesn’t make my skin feel overly heavy or coated. It too has a lovely citrus scent that has become my new obsession. As well as the products being effective and handmade, the packaging is as adorable as can be, and affects a black and white Alice in Wonderland feeling—think quaint doodles of owls, trumpets and bamboo shoots—on each product. Not only does it make facial care fun, Eve of St. Agnes products are good for the environment and they actually work. Way to go, jolly old England!